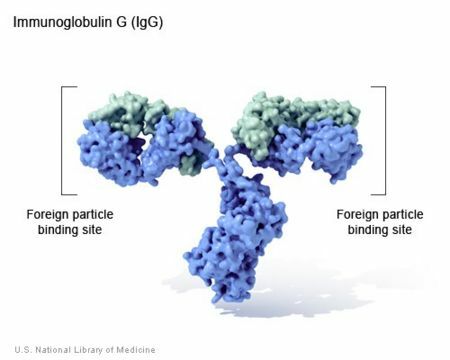 An antibody (Ab), also known as an immunoglobulin (Ig), is a large Y-shaped glycoprotein synthesized and secreted by plasma cells derived from B lymphocytes, the plasmocytes, present in plasma that is used by the immune system to identify and neutralize foreign objects such as bacteria and viruses. The antibody recognizes a unique part of the foreign target, called an antigen. Antibodies can be extremely selective for their ligand and are useful in several aspects of cell biology such as immunofluorescence microscopy and western blotting. ↑ Charles Janeway (2001). Immunobiology (5th ed.). Garland Publishing. ISBN 0-8153-3642-X. ↑ Bolsover, Stephen R.; Hyams, Jeremy S.; Shephard, Elizabeth A.; White, Hugh A.; Wiedemann, Claudia G (2004). Cell Biology. Hoboken, New Jersey: John Wiley & Sons. p. 445. ISBN 0-471-26393-1. This page was last modified on 21 August 2012, at 16:23.